Summer is almost here. But before you head outdoors and bask in the warm rays of the sun, don’t forget that UV radiation poses some threats. Not only does your skin react to the sun’s radiation, but your eyes do too. Studies have shown that exposure to UV radiation can damage your eyes. This damage can actually take many forms. Here are some conditions that you might not know about, in honor of UV Awareness Month. This condition occurs when your cornea (the clear surface of your eye) suffers a burn from UVB rays. It’s also called “snow blindness” when the condition occurs in the winter months due to the reflective property of snow. Artificial sources of UVB rays can cause photokeratitis too. These may include a welder’s arc, lighting, halogen desk lamps, sun tanning beds, and photographic flood lamps. Symptoms of the condition include blurred vision, redness, halos around lights, and temporary loss of vision. This is a condition that causes redness of the eyelids. This can be caused when UV radiation exposure irritates and inflames your eyelids. A cataract is a clouding of the eye’s natural lens. This lens is situated behind your iris and your pupil. Cataracts are the most common cause of vision loss in people over the age of 40. 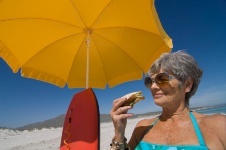 Exposure to UV radiation ups your risk for getting a cataract. This is a medical condition that develops as a consequence of prolonged exposure of your eyes to direct sunlight or bright lights. This prolonged exposure leads to damage of the macula, the part of your eye responsible for producing your central, high resolution vision. Light can damage the retina when it is very intense. This is one reason why scientists encourage us not to look directly at the sun, even during an eclipse. Your retina helps to create a visual representation of the world around you by responding to light. Now that you know that sunlight and even bright artificial lights pose a real threat to your eyesight, there are some precautions you can take, recommended by Prevent Blindness America (the oldest volunteer eye health and safety organization in the U.S.). Keep these tips in mind, especially during UV Awareness Month, which takes place every May, and stay safe in the sun. “How UV Rays Damage the Eyes,” Prevent Blindness America web site, April 24, 2013; www.preventblindness.org, last accessed April 30, 2013.